Both Group B games in the second day of the Africa Cup of Nations ended as draws but Yannick Bolasie shone during the Democratic Republic of Congo’s 1-1 draw to 2012 winners Zambia. As DR Congo went behind early on to a Given Singuluma goal, Zambia sat deep meaning that the onus was on DRC to create and Bolasie took on the mantle. The Crystal Palace winger was a constant threat throughout the game. Initially starting on the left hand side for the Leopards, Bolasie was direct and tried to fashion some clear cut chances when running at his Zambian opponent Davies Nkausu. Intelligently, Bolasie didn’t only stick to the left hand side but also switched to the right flank. As the game went on he started to pick the ball up in the middle of the pitch and, with his direct running, he started to become his side’s main attacking outlet. and the player who was most likely going to create a clear cut chance for them to draw level. He had the most touches of any Congolese attacking player with 48 and was also the player on the pitch who attempted the most dribbles. In the 66th minute it was obviously Bolasie who drew his team level. 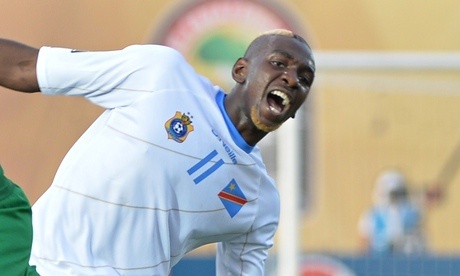 Cedrick Mabwati laid the ball off to Bolasie to smash home and earn a point for DR Congo. After rejecting an earlier call up Bolasie has become a key member of the side. He might fancy himself as a lord of the mic but he’ll need to rule the roost on the pitch if the DR Congo are to progress from Group B.